The Starfire Event Center is capable of holding ANY type of event, large or small! We are an All-Service Event Center, which means minimal work for you! We offering Catering, check our our menus below! We can even do Offsite Catering for food AND alcohol. Did you know we also have Golf Simulators, you can still enjoy golf all winter long at the Event Center. Our second ballroom is brand new, so make sure to stop in for a tour soon! We are excited to share another beautiful venue with our community. Please contact our Event Coordinator Mindy Johnson for any more details or to come in for a tour! Offering the Best Minnesota Beers! 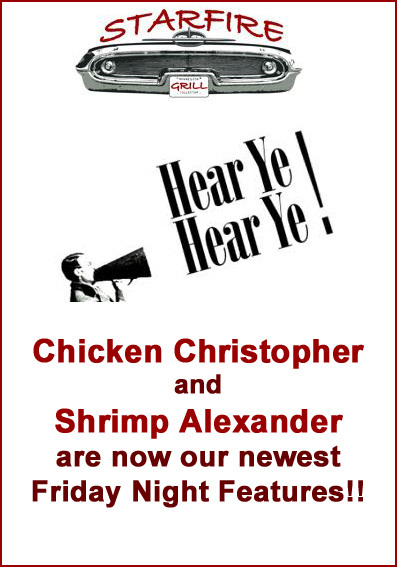 Chicken Christopher and Shrimp Alexander! Every Sunday from 9am -1pm, Starfire serves up an incredible brunch buffet! Our Sunday buffet dishes up something for everyone. From the classic scrambled eggs, bacon and sausage, to biscuits and gravy, pancakes, fresh fruits and salads, and even fresh broasted chicken! We offer so many options that we don't have the room to list them all here. So grab your hungry family and join us on Sundays for the best deal in town! All You Can Eat! Bringing a group of 8 or more? Reservations are greatly appreciated! The Starfire Grill also has nightly features that change continually to always offer something new. With seating for 120, an elegant atmosphere, impeccable service, and handicap accessible facilities, you can't go wrong. 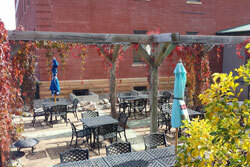 We accept reservations for any party of 8 or larger and offer gift certificates for any amount. Find out how relaxing a delicious steak dinner can be. Call to schedule tour, check our schedule for various events.